Movie lists are all well and good but, let’s face it, they are never definitive. As soon as I complete one list, I realise the (now completely obvious) film that I have missed. However, lists can prove useful when you are short for time or desperately in need for some cinematic inspiration. This often occurs when I am scrolling through Netflix. Yes there are categories, but it can still be a challenge to actually commit to a film. 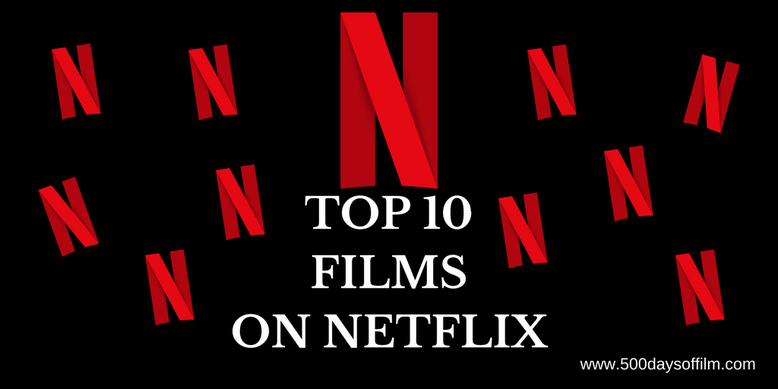 As a result, in this post, I list ten great films on Netflix (plus a few honourable mentions at the end). Thirty years ago, aliens made first contact with Earth. Humans waited for the hostile attack, or the giant advances in technology. Neither came. Instead, the aliens were refugees, the last survivors of their home world. The creatures were set up in a makeshift home in South Africa’s District 9 as the world’s nations argued over what to do with them. When Wikus van der Merwe (Sharlto Copley) contracts a mysterious virus that begins changing his DNA, he becomes the most hunted man in the world, as well as the most valuable – he is the key to unlocking the secrets of alien technology. Ostracized and friendless, there is only one place left for him to hide: District 9. 13th starts by addressing a truly stunning statistic. The US - often called the land of the free - has the highest incarceration rate in the world. Even more shocking is the fact that one in three black males in America will go to prison at some point during their lives. That's compared to one in 17 white men. Ava DuVernay’s documentary looks at what lies behind this discrepancy. A series of fascinating experts and academics explain how, after years of fighting for freedom and equality, black communities are still waiting for change. I just love Sofia Coppola’s superb tale of love and repression. Inside a suburban house in 1970s America, live the five Lisbon sisters. The doomed fate of these beautiful sisters will leave an indelible impression on the neighbourhood boys. The Age Of Adaline is a sweet and unchallenging film about a timeless romance. Blake Lively is great as Adaline - full of poise and restraint. Michiel Huisman is a charismatic and engaging screen presence and Ellen Burstyn is brilliant as Adaline’s daughter, Flemming. However, it is Harrison Ford’s portrayal of William Jones that effortlessly steals the show. His performance is just wonderful in this movie - reminding me (as if I could forget) of his impressive range. A chance meeting outside a Berlin nightclub plunges lonely Spanish girl, Victoria (Laia Costa), into the chaotic world of four young local men. Sonne (Frederick Lau) and his friends promise to show her a good time and introduce her to the real side of the city. As Sonne and Victoria's flirtation turns into something deeper, he convinces her to come along for the ride. However, the men are in trouble and, as the night rolls on, events spiral out of control. Victoria was shot in one continuous, uninterrupted take in the early hours of one Berlin morning in April, 2004. German director, Sebastian Schipper, gathered his small cast and crew, started shooting his movie around 4.30am and finished filming at approximately 7am. The end result of this audacious project - part romance, part bank heist drama - is a gripping, exhausting and thoroughly entertaining film. Neil Marshall’s The Descent is my favourite horror movie. A group of friends decide to go on a caving expedition in the Appalachian mountains. However, their adventure goes terribly wrong when they become trapped. Their only option is to go down, down further into the depths of the cave. Little do they realise what horrors await. I own this film on (old school) DVD but felt pleased to see its appearance on Netflix for two reasons. First, it may introduce this claustrophobic tale to a new audience. Second, it enables me to watch my favourite scenes wherever I happen to be and whenever I want. Win, win! Staying within the horror genre, I would also recommend Jennifer Kent’s The Babadook. Following the tragic death of her husband, Amelia is a left to bring up her extremely demanding son, Samuel. She is absolutely exhausted as, plagued by nightmares, Samuel keeps her awake - every night. Stretched to breaking point, she still makes time to read to Samuel before bedtime. One night, they find a new pop up book called The Babadook. Amelia starts to read - realising too late just how dark and scary the story is. There are lots of action movies on Netflix. However, Gavin O’Connor’s Warrior is one of my absolute favourites. The film follows two brothers (brilliantly played by Joel Edgerton and Tom Hardy) as they compete in a major mixed martial arts tournament. The movie is both hugely entertaining and surprisingly moving (and features a classic performance from a very growly Nick Nolte). Concerns about Ant-Man were high after director, Edgar Wright, walked away from the film. While this still feels like a massive missed opportunity, the end result is a lot of fun - largely thanks to an endearing performance from Paul Rudd and a scene-stealing turn from Michael Peña. Other Netflix films of note include Tramps, Frailty, Divines, Hush and The Cabin In The Woods. What other movies would you add? Let me know in the comments section below!